I am always game to try out a new city bike, so I was excited to test out the new Pilen Lyx ‘Portlandia’ for a few weeks this past spring. Pilen is a Swedish bike company, founded in 1999 with the intention of creating a sturdy line of city bikes in a classic Scandinavian style. Like most American bicycle companies, the firm designs and assembles its bikes in Sweden, and has the frames constructed in Asia. The Pilen Lyx is their all-road model, meant to be used on pavement as well as dirt roads and gravel. It’s got easy handling and a super comfortable ride. In a nutshell, it’s a lighter-duty version of the venerable Dutch city bike—a lighter weight, no skirt guard, a chainguard instead of a full chaincase—but still fully equipped for the rigors and pleasures of everyday urban transport. In addition to all this, the Lyx has a little secret: it’s downright speedy. The bike rewarded my pedaling efforts with perky acceleration and a vigorous cruising speed. In fact, for whatever reason, I was able to go faster, more easily, on the Lyx than on my Kogswell, a lighter French-style city bike with a more aggressive, forward-leaning posture. It was hard not to smile as I zipped along. Even in headwinds and up hills, the bike surged forward under my efforts. I began to refer to the bike’s “built-in tailwind.” Once or twice I actually caught myself checking to make sure there was no hidden electric assist behind the bottom bracket. I reckon that the reason the Lyx moves so nicely is because of something that Jan Heine, of Bicycle Quarterly magazine, calls “planing.” In effect, the frame flexes in sync with the user’s pedaling, causing a positive feedback loop that makes the bike feel more responsive and easier to ride. Assuming this is the case with the Lyx, the frame’s flexibility is a boon to its ride quality, but the down side is that the Lyx is not the ideal bike for very heavy loads or multiple kids. This is not really much of a down side, since if you want to carry loads like that, you ought to do it right on a Workcycles FR8, an Azor Oma, or a good old cargo bike. I tested out the Pilen Lyx during a very wet couple of weeks in early April—an ideal time to assess the bike’s performance and usefulness in, alas, a variety of weather conditions. The bike I used is slightly different from the Pilen Lyx that you will see described online. The model I tested was a prototype of the Pilen Lyx ‘Portlandia’, a kind of sub-type that will be specially equipped according to Clever Cycles spec. The official ‘Portlandia’ version will be a little different from what I tested, but not that much. 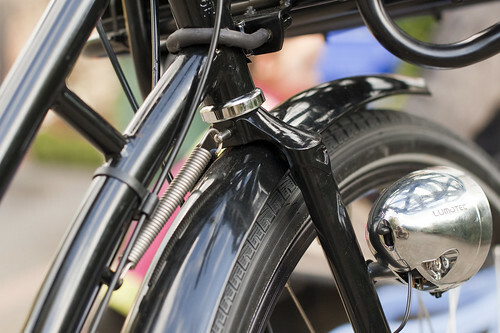 The bike is fitted with hub brakes, and internal gears. The rear hub is an 8-speed Shimano Nexus with roller brake. 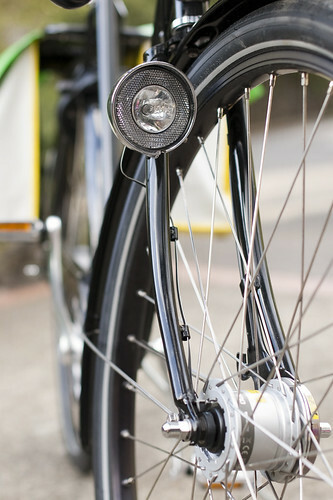 The front hub is a Shimano dynamo hub, also equipped with roller brake, which provides power for a fork-mounted LED headlight. The bike I tested used a halogen headlight and lacked a standlight (in other words, the bike went dark when it stopped rolling, even at stoplights), but I am told the ‘Portlandia’ will be equipped with an LED headlight with standlight. The taillight is battery powered, and has a sensor that turns it on when the bike starts moving. I’d probably just replace it with a wired taillight, but it was pretty neat. Wheels were heavy duty 700c (or 28″, as they say in old Stockholm) with super fat 2″ wide Big Apple tires, which, in combination with the sprung Brooks saddle, provided an extremely pleasant, smooth, comfortable ride, even on rougher pavement and gravel roads. The handlebars are barely-swept back city bars, a kind of cross between MTB-style “flat bars” and your traditional city bike handlebar. I prefer a more swept back handlebar style, but I did come to appreciate the simple usability of these bars. Shifting is achieved with a grip shifter, which, again, is not my preference, but the shifting was smooth and reliable throughout the test. The bike also comes equipped with a rear wheel lock and plug-in chain, and a Pilen-model bell that was a bit anemic (I attached a Crane brass bell instead). Stainless steel fenders (but no mudflaps) and a rear carrier rack are included, both painted black. My test model also had a frame-mounted front rack, a version of which will be made available as an option for the ‘Portlandia’. I zip-tied a milk crate to my front rack to use as a basket for most of my rides. For part of my test, I took the basket off and used the rack as a flat platform to carry various bags. 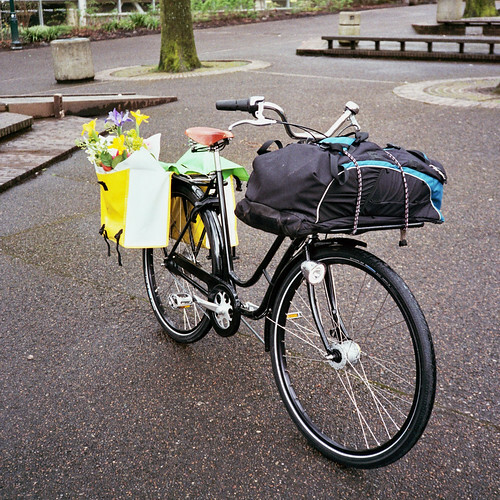 I used rear panniers a few times when I needed extra cargo (for example, coming home from the farmers’ market). The photo at the top of the post shows the bike loaded with market produce, flowers, and a backpack full of more produce and extra clothes I’d shedded during a day of working the market. I used the Pilen for my everyday trips: to appointments, a few parties and engagements, the library, and, of course, the farmers’ market. Essentially, every time I wasn’t carrying my daughter in the Christiania, I rode the Pilen. This is normal use of a bike for me: short trips, in the city, wearing everyday clothes. The Pilen served me very well for these tasks. Locking up was fast and easy thanks to the wheel lock—no need for a cable, just a U-lock on the front wheel/frame and a flick of the wheel lock, and I knew the bike was locked up solid. The large front rack (and basket) carried everything I needed for these everyday trips. Even a few heavier loads, carried home from the farmers market, were no trouble. One evening, returning from a party, I was surprised by rain; fortunately I had brought a rain cape in my panniers, so the ride home was pleasant and dry thanks to the fenders, easy shifting, and the smooth stable ride afforded by the huge tires. Overall, the bike proved to be a worthy and versatile transportation device. This opens up a minor can of worms which I will idly pick at here. There are at least two, probably more, schools of thought on front-load carrying. Some people (notably Henry at Workcycles) are proponents of frame-mounted racks. 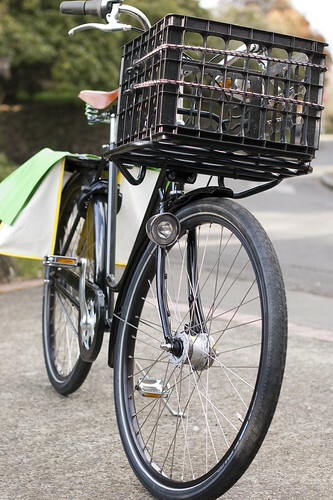 Others (Jan Heine of Bicycle Quarterly, for example) prefer a smaller front rack or basket, attached to the bike’s fork. The fork-mounted school claims that the effect on handling can be managed by a low-trail geometry, and that the bike will ride more naturally than with a frame-mounted rack. Frame-mounters would claim that the fork-mounted rack is not as useful because it can’t carry as much and is unstable when parked and loaded. I am familiar with the pros and cons of each method. My Kogswell is a low-trail bike designed to carry a large load on a fork-mounted rack. It carries 30- or 40-lb loads without difficulty, and the handling is affected, but in a way that is useful; the steering changes slightly with the differing loads in a way that is predictable and easy to manage. With a rear load of any size, my Kogswell exhibits a front-end wobble that is suspiciously similar to the frame-mounted-rack wobble, but since I stopped carrying anything (even a rack) on the back of the Kogswell, I’ve had no handling problems at all. I think that in general, if you are looking for a heavy load carrier, a frame-mounted rack will serve you well, whereas if you just want to add significant daily carriage ability to your bike, a fork-mounted front rack is the way to go. I like my Kogswell for most of my solo transport, and if I need to carry bulky or heavy loads, or a kid or two, I just take the Christiania. I could comfortably carry more weight, and significantly more bulk, on the Pilen’s frame-mounted rack than I could on the Kogswell. The cargo wobble is a minor side effect of this convenience. I would recommend the ‘Portlandia’ for anyone seeking a solid city bike. 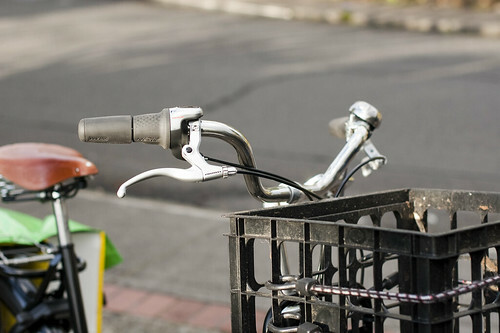 It’s a great introduction to city bikes for North Americans—its zippy ride, semi-swept-back bars, and relatively lighter chassis will feel comfortable to users accustomed to riding mountain bikes and ten-speeds. It’s perfect for everyday loads, and for family use—you could carry a kid on the front or back pretty easily, although it’d lower your cargo capacity. It’s not for super-heavy loads, or for very fast riding. But for getting around town in style, the Pilen Lyx ‘Portlandia’ is an excellent choice. Where to buy: Clever Cycles in Portland, or contact Boxcycles to for ordering information and other dealers. Thanks to Todd at Clever Cycles and Will at Boxcycles for making the bike available to me for an extended test. I have a non-frame-mounted front rack on my step-thru Raleigh (http://www.flickr.com/photos/poetas/5910326543/in/photostream), and with heavy weight on it, I notice some flex in the frame as well – kind of a back-and-forth wobble. 20-30 lbs isn’t so bad, but 40-50 is definitely about as much as I feel comfortable being able to steer well with. Now having the step-thru WorkCycles Secret Service, that frame is notably more rigid than my Raleigh. We haven’t gotten the frame-mounted front rack for it yet (though we will soon), so it will be interesting to see how it handles weight in comparison to the Raleigh. I also have that same headlight, but the version WITH a standlight. Great looking bike – I love the rear part of the rear rack, where it says PILEN. Just the overall aesthetic and lines of the bike are very nice. Only major issue I see, is that it looks like it has kind of a wimpy kickstand – did it pose any problems for you? Dave, I agree, it is a really pretty bike. The kickstand worked fine– even holding my relatively large, unwieldy load shown at the top of the post. This is a further advantage of the frame mounted rack– less likelihood of the front end flopping around when the bike is parked. Will from Boxcycles approached me about doing a test. They’re distributing the bikes in the US. I test rode a Halsted with and without load and tried specifically to get it to wobble. Without I couldn’t get one. With a 30lb+ load of loose pedals in a bin I was able to oscillate it, but only after violent shaking of the bars. A large part of it was the pedals moving within the bin and the taut innertube fasteners flexing. IMO rider position and weight distribution have a lot to do with it. Hi Peter, I don’t actually know, and besides the one i used was a third-party stopgap solution while Pilen fixed on their actual brand (or maybe it was that they are going to make their own). You should contact Boxcycles, the US distributor, as they will know. Thanks for your interest. don’t have one yet, but they are working on it.. Thanks for your reply, we sell many of Pilen here in Australia now. hope you can reply to this. i just bought a commuter type bike for the first time and researching cargo-carrying options. quite like the “bags” on the rear rack you’ve got in the photo above — can you tell me who makes them please? I’m not the one who writes the blog, but I think I can answer the question – I’m pretty sure those are the CleverChimp panniers from Clever Cycles (http://clevercycles.com/store2/index.php?product=Cleverchimp+panniers&c=31) in Portland, OR.